No other symbol evokes as much patriotic pride as the United States flag. 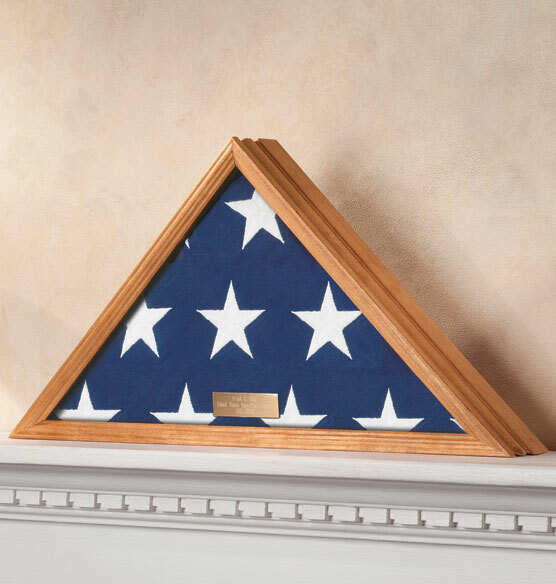 Proudly display your flag in this elegant personalized veterans flag display case. The perfect tribute for a veteran, it’s an excellent value and includes features usually found on more expensive cases, including a hinged opening in the back for seamless display. The brass plaque, personalized with your message, is ideal for presenting it as a gift. This military flag case makes a thoughtful gift or remembrance memorial. When I first found out about exposures I wasn't sure of what I was gonna get. I read a few reviews and I said hey, I'm going to give them a shot. Yes the first one I originally wanted was out of stock. And I was the inpatient one. And asked customer support if I could get a different one since they shown several Styles . Not only did they work with me to help in a time of lose; they had the brass cut and it was sent out in approx. 4 days . Best service , friendly staff, anything you can ask for in a company. Looks good, has a Glass front & reviews were good. its the correct size and allowed engraving. My husband just passed and I wanted to preserve the flag used at his funeral. It's lovely, can be personalized and it's the perfect price. my husband had a military furneral and received a flag. This item looks classy and had the best review. It was nice and affordable. For my husband, since his Father was his hero, and he passed away in early 2016. My husband was given the American Flag at his services, as a tribute to his Father's service in the Army. After looking at local shops I felt this one fit my needs best and also was comparable in price even with shipping costs. It was the only flag display case I found that fit the size of the flag. I was assisting my aunt in getting an appropriate display case foe her husband's flag. This will be used to display flag draped on my husband's casket. I gave the flag to my first grandson, who never knew his grandfather (Gerry). Now he will have the perfect display case for the special flag. It is perfect for my husband's memorial flag and the price was the best around for the same quality item. is the front glass or plastic? What does the back look like. Is it a solid piece of wood that opens to put in the flag? If it is wood, what kind of wood and how thick is the wood? How does the back stay closed once the flag is put in? Can you show a picture of the back? Is the back of the brass plate adhesive to attach to the front, either glass or plastic? Once it is placed, is it permanent? Is the front covering glass or plastic? Is this configured for WALL hanging? Will this case hold the 5 x 9.5 flag? BEST ANSWER: I can't verify the size flag I have but it sounds close to your dimensions. The flag for my window box was draped over a standard size casket. What’s the measurements of the flag display case? BEST ANSWER: Thank you for your question. Measures 16” wide x 22 1/2” high x 4 1/2" deep. We hope this information will be of help to you. BEST ANSWER: Thank you for your question. This Veterans Flag Display Case is made in the USA. We hope this information will be of help to you. Sorry to bother you again, but what are the dimensions? It measures 16” wide x 22 1/2” high x 4 1/2" deep. what size is the brass plate? BEST ANSWER: Thank you for your question. The plaque is 1 x 3.5. We hope this information will be of help to you. Is this case the standard VA funeral flag? BEST ANSWER: Thank you for your question. This will work for any standard size flag. We hope this information will be of help to you.